We buy and register your PEC certified email! 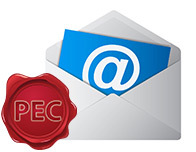 PEC certified email account. We purchase and register an email accout for your account. The purchase of the email is bound to the possession of the domain at our Reference Provider.